The Hyundai Tucson is due for the massive update for 2019. In fact, the company has even displayed a revamped model at the New York Auto Show 2018. After the facelift, it would look more in line with the big Santa FE. Plus, it has more tech inside the cabin and a better mechanism under the hood as well. However, the most highlighting fact about the new update is that the company has now used a naturally-aspirated engine in place of the turbocharged one. In the Middle Eastern market, it is presently offered in a 2.0-litre and a 2.4-litre guise which make 165 PS and 176 PS respectively. Tucson is available in 10 different colors - Pure White, Blue, Platinum Silver, Phantom Black, Galaxy Pearl, Milk Tea, Pepper Grey, Ruby Wine, Sedoan Orange and Sepia Topaz. Hyundai Tucson is a compact sports utility vehicle that quite sleek in its looks and gives a decent performance as well. It has a fluidic sculpture design that gives it a modish look. This vehicle is presently offered in a total of eleven attractive shades for the buyers to choose from. Its aggressive frontage features projection headlamps with LED type positioning lamps, while the chrome treated radiator grille gives a bold design statement. The side profile has electrically foldable ORVMs with blinkers, while the character lines further adds to its sporty appeal. The wheel arches are fitted with a set of alloy wheels, which are covered with tubeless tyres made with high performing silica. Its rear end includes LED tail lamps, a sporty spoiler with high mount stop lamp and a bumper as well. The interiors are done up excellently, which gives a contemporary feel. The space inside is quite good and there is a panoramic sunroof available that lets in fresh air and natural sunlight. It includes foldable rear seat that can make more room for luggage, while the utility based aspects further enhances the comfort levels. The company has ensured maximum protection of its passengers by incorporating various safety aspects in it. Some of these include the electronic stability control, six airbag system, rear parking assist system, active headrests as well as seat belt pretensioners. This vehicle comes equipped with two gasoline and one diesel power plants. The 2.0-litre MPi engine is available with both manual and automatic versions. It gives out power of 158ps at 19.5 Kg.m torque. Whereas, the Theta II 2.4-litre motor can deliver power output of 170ps at 22.4 Kg.m. On the other hand, its diesel engine offers a decent fuel economy, while allowing to it accelerate in around 9.8 seconds. It has the basic warranty of 36 months or 60,000 Kilometers, whichever comes earlier. The elegantly designed interiors are one of the best things about this robust vehicle. It gets the dual tone color scheme, which is simply attractive, while the premium leather seat covers further gives a luxurious feel. The cabin features heated seats at front that makes its occupants feel warm, while the 60:40 split folding facility to the rear seat helps in making more space for luggage. It includes some storage spaces like a 6.2-litre center console with a tray, blue illuminated cup holders, overhead console with storage facility, cargo screen and a few others in the list. The automaker has packed it with numerous practical features that ensures maximum comfort of its occupants. It has an efficient air conditioning system that allows to set the temperature inside accordingly. The 12V power outlet in the cargo area is useful for charging mobile phones and other devices. There are power operated windows available, whose controls are positioned on the driver's door. The availability of a panoramic sunroof is a plus point, which not only adds to its style but also brings in cool air and light. Besides these, it has engine start and stop button, supervision cluster with LCD TFT color display, automatic cruise control, electronic chromic mirror with rear camera display, smart key and a music system with USB connectivity. The head and shoulder space offered inside the cabin is quite good, while the legroom is also very sufficient owing to its large wheelbase. It has a spacious boot compartment, which can be increased up to 1414 litres with the rear seat folded. This SUV is blessed with a new generation audio system that comes with a CD, MP3 player, AM/FM radio tuner and has speakers as well. It also supports USB port and auxiliary input options. It has a supervision cluster with color TFT LCD display that provides information of the vehicle. On the outside, this Hyundai Tucson SUV series looks simply amazing with a number of striking features. The front fascia includes a large windscreen that is integrated with a pair of intermittent wipers and there are expressive lines present on its sleek bonnet. It has bright projection headlamps with LED positioning lamps and turn indicators as well. This surrounds the bold radiator grille that gets chrome treatment and engraved with the company's insignia. The body colored bumper is well sculpted and fitted with an air intake section as well as a pair of fog lamps. The side profile features outside mirrors with LED side repeater lamps, door handles and flared up wheel arches that are equipped with a set of alloy wheels. Its rear end is designed with a sporty spoiler including high mount stop lamp and a stylish boot lid with company's badge on it. There are LED rear combination lamps available, while the bumper, windshield with a wiper and a couple of reflectors gives it a sporty appeal. It is built with an overall length of 4410mm along with a width and height of 1820mm and 1655mm respectively. With roof racks included, its height comes to 1685mm. It has the wheelbase of 2640mm, which is quite pretty large and indicates to spacious interiors. This vehicle is offered with an option of choosing from a set of 17 and 18 inch steel as well as alloy wheels. The 18 inch alloy wheels have tubeless tyres of size 225/55 R18, while the others rims are covered with 225/60 R17 sized radial tyres. The 2.0-litre gasoline engine is capable of returning a fuel economy ranging between 11 to 12 Kmpl, whereas the other power plant can return around 10 to 11 Kmpl. Meanwhile, the CRDi diesel mill also gives a decent mileage under standard driving conditions. 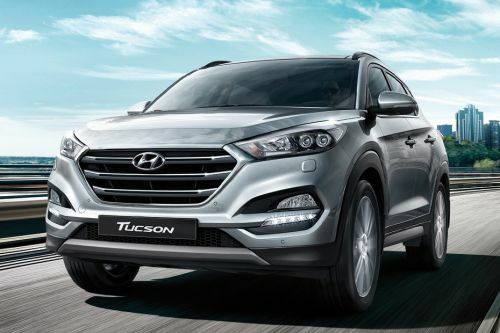 This Hyundai Tucson model series is incorporated with a 2.0-litre and 2.4-litre gasoline power trains that are integrated with a multi point fuel injection system. These have the ability to displace 1999cc and 2359cc respectively. It is also powered by a 2.0-litre diesel motor that comes with a total displacement capacity of 1995cc. This mill is incorporated with a common rail direct injection system. All these power plants are paired with a 6-speed manual and automatic transmission gear box that enables easier gear shifts. The EU-2 versions with a 2.0-litre motor can generate 158ps with torque of 19.6 Kg.m, while the same comes to 154ps along with peak torque of 19.5 Kg.m in the other versions. The Theta II 2.4-litre mill produces power and torque of 177ps and 23.1 Kg.m respectively in EU-2,3,4 versions. Meanwhile, the same engine also delivers around 170ps at 22.4 Kg.m in the EU-5 version. On the other hand, its diesel mill is also available with two power options. It can belt out 177ps power in combination with 40 Kg.m torque. The same motor also churns out 184ps besides yielding torque output of 39 Kg.m in the EU-4 versions. The manual and automatic variants with a 2.0-litre gasoline engine can attain a top speed of 185 Kmph and 176 Kmph respectively, while accelerating from 0 to 100 Kmph in nearly 10.7 to 11.5 seconds. Meanwhile, the trim with a 2.4-litre motor takes around 10 seconds to cross the 100 Kmph speed mark and achieves a maximum speed of 185 Kmph. On the other hand, the top speed attained by its manual diesel variant is 195 Kmph and it accelerates 0 to 100 Kmph in 9.4 seconds. Whereas the automatic and manual 4WD versions breaks the 100 Kmph speed limit in nearly 9.8 seconds, while achieving a maximum speed of 194 Kmph and 195 Kmph respectively. The manufacturer has equipped it with a reliable braking mechanism that is further assisted by anti lock braking system. The front axle is assembled with a McPherson strut and the rear one has a multi link type of system. It has a hydraulic power assisted rack and pinion based steering system that makes handling very convenient to the driver. There are many advanced safety aspects loaded in this robust vehicle that include rear parking assist system, electronic stability control, hill start assist as well as down hill brake control system. It has six airbag system, which comprise of dual front, two side impact as well as two curtain airbags. In addition to these, the list also includes a high mount stop lamp, rear defogger, high mount stop lamp, door lock system and a few other such aspects. I feel like it is the perfect modern SUV for your daily commuting requirements as well as weekend getaways. 2019 Hyundai Tucson - What to expect?